Something I have learned from being a Dad is that when you are truly present you give yourself the chance to fully enjoy unscripted moments. Not just the excitement and the joy, but the underlying meaning that is attached to those involved. One such moment occurred this past Labor Day weekend when my Dad, 74-years-young, competed in the Boyne City Triathlon. For those who know him, it was no shock. That is just what he does and who he is as a person. He is not a former professional triathlete, but a man who is authentic as the day is long. He has always set goals that pushed him and never stopped working toward those goals. Hell, in the fall of 1985 he competed in the Lake Coralville Ironman, a 2.4-mile swim, 112-mile bike ride, and a 26.2-mile run. It was his first Triathlon of any distance at the age of 41. Insane? Maybe. Especially since the day was miserable and it was a last-minute decision if the race was going to be held because the weather was so hot. 90 degrees with 95 percent humidity, in Iowa. Nothing against Iowa, but that was not the exotic backdrop which the Hawaii Ironman provides. II7 people started the race and I believe somewhere around 21 finished. The 21st person was my Dad. A short while into the run when they realized he was the last one on the course, he was encouraged by race officials to call it a day and be proud of what he accomplished. My Dad was not going to quit. As a matter of fact, it deepened his resolve to finish. Plus, he could not stop talking about having a beer and fried chicken afterwards. So, finish he did. 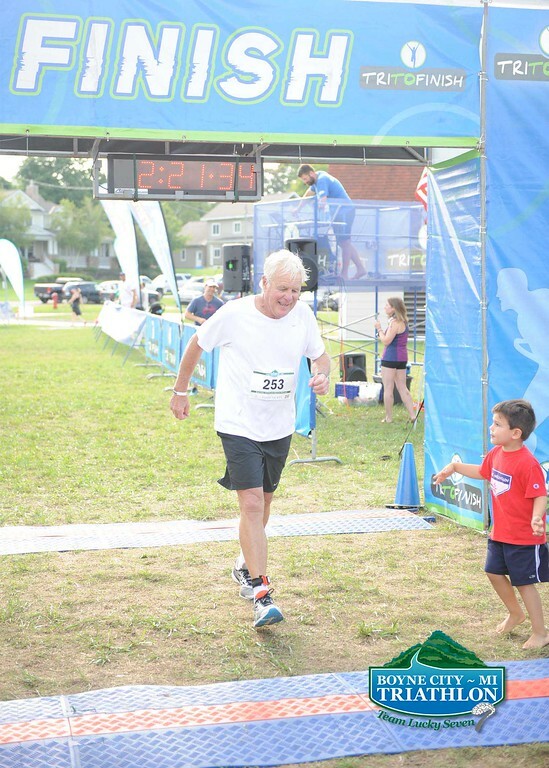 Now here he is, crossing the finish line of his 17th triathlon (not counting the Ironman), and out of the crowd sprints his four-year old grandson. There are many layers to what make this story so special, but the only one that mattered to my Dad was the fact that EJ were going to run across the finish line together! He even said so in an email to EJ. Yes, he writes the kids an email each month on their birth date. Nothing surprises me about my Dad. He is someone who I dedicated to a certain lifestyle of constant growth and learning. I am currently re-reading Dr. Jerry Lynch’s incredible book, The Way of the Champion, Lessons from Sun Tzu’s The Art of War and other Tao Wisdom for Sports & Life, and it is my Dad to a tee. In his book, Dr. Lynch describes dedication as the devotion to a certain way; in this case the lifestyle of a champion, in order to make the most out of oneself and discover just how darn good you can be. Dedication is a deeper, stronger, more passionate level of commitment. Being dedicated is the spiritual space that embraces failures, fatigue, setbacks, mistakes, frustrations, suffering, and sacrifices on the journey of being the best you can be. It requires fundamental faith, trust, and confidence in the process, as you display patience and perseverance…… Being dedicated means a certain willingness to do all that is required to grow and improve- even if you sometimes don’t feel like doing it. Think Cal Ripken, Jr, Derek Jeter, and Tim Duncan! How you do anything is how you do everything and it is evident in my Dad, Cal, Derek and Tim… being a champion is a way of life and it is not limited to the court/field/course on which you compete. It shows up in every facet of your life. In the business world we all talk about balance in the sense of work/life balance, but I want to share another type of balance with you. And one more thing that struck a chord with me is a study conducted with Olympic athletes have shown that those with balance, those who pursue excellence, have better chances of success than those who set unrealistic, perfectionist goals. This is true in all aspects of the corporate structure, family life and any spiritual/emotional endeavor. This balance is one of the reasons that champions do not self-destruct when perfection is not attained. What three things can you do right now that would bring more balance to your career and life? I study successful people daily and there is a wealth of knowledge in the books I have read. If you would like a list of these books and more then check out my resource page on my website. Over the course of my career, I realized the importance of being committed versus being interested. Being committed versus being interested begins with being honest with yourself.